There are several types of water heating solutions in todays homes. Multiply that by the many manufactuers. It is important to know what type of system your home utilizes, where it is located and how to turn it off or maintain the equipment. If your water heater tank ruptures, then you need to shut off the water immediately. The water will continue to flow causing more damage and increasing your water bill. Maintenance on water heaters is often forgotten. Silt and sediment builds up over time at the bottom of tanks. The tanks should be drained and the sediment purged yearly. There are DIY resources online that may help with a water heater purge. If you are not a “handy” this is a service Airforce Heating and Cooling offers, but is time consuming and therefore may be a bit costly. If you are unsure of whether you can tackle this obstacle, then please give us a call. Depending on the age of your unit, it is sometimes advantageous to replace. Lime build up in standard water tank. As for the types of water heating equipment, they generally work the same. Then there is a tank-less type of water heater which is gaining in popularity for its efficiency, compact design and the fact you never run out of hot water. 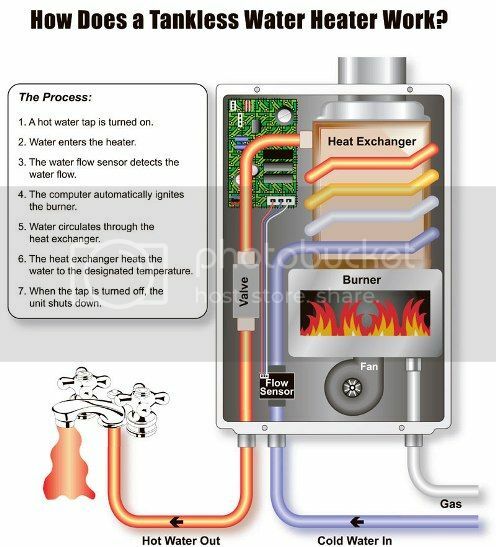 Tankless hot water heaters heat water directly without the use of a storage tank. When a hot water tap is turned on, cold water travels through a pipe into the unit. Either a gas burner or an electric element heats the water. As a result, tankless water heaters deliver a constant supply of hot water. You don’t need to wait for a storage tank to fill up with enough hot water. There are several brands who manufacturer tankless heaters. We can not comment on electric tankless heaters because we have not installed or know anyone who has yet to install one. It is important to consult your Contractor to determine your water heating needs.